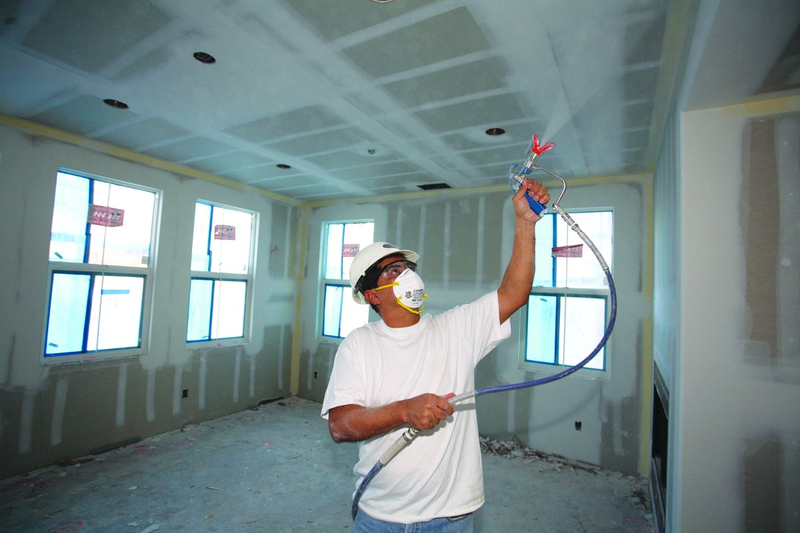 Paint sprayers usually depend on air as it is the only way to deliver pressure for spraying. But now it is possible to spray paint without using air. These sprays utilize pumps that can push up the paint to the hose and the paint comes out through a gun without air pressure. An airless paint sprayer functions by pumping out paint at an excessive pressure, which is 3000 psi. The paint comes out via a hose and it comes out through a very small hole via spray gun tip. The tip is specially designed to break the paint in an even manner and the spray comes out in fan-shaped and in form of tiny droplets. Surface tension and viscosity binds the liquid together and atomization taking place scatters these to develop droplets mist instead of fluid mass. In these sprayers, there is a lot of energy produced due to high pressure injected in the paint. The amount of liquid that would come out is decided by the size of the hole in the spray nozzle. In the market, there are different ranges of tips available to manage atomization that causes varied spraying sizes and patterns. The three components of airless sprayers are the spraying gun tips, pumps, and motors. Majority sprayer tips can be interchanged mainly for flexibility and you must choose the tip size accordingly based on the capacity of the spraying unit, the type of paint sprayed and the amount of pressure needed for atomization. These tips come with numbering systems, the smaller numbers are best for spraying stains and lacquers, a bit larger ones for enamels, even larger for indoor latex paints and oil-based ones. The largest tips are for thick coatings like exterior latex coats. Airless units are best for onsite spray painting because it is very easy to transport. It’s a versatile technique because it can be used in both exteriors and interiors on various projects. 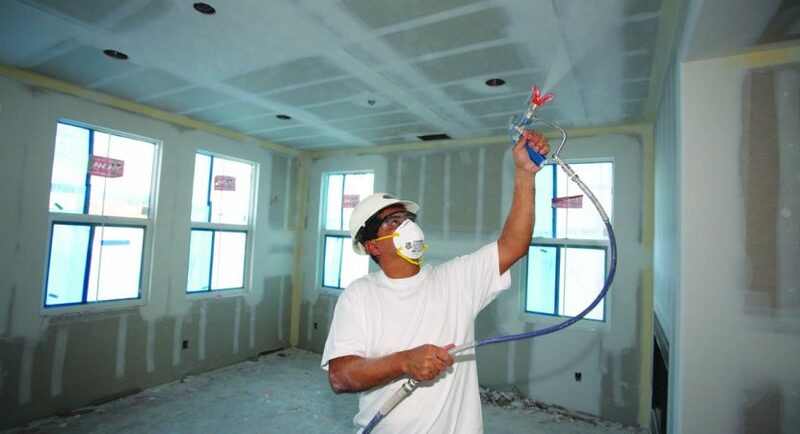 Airless spraying is best for easy recoating because painting can be done quicker than a brush or roller. This saves a lot of labor time. Airless technique covers a broader area so work is faster. Paint is laid on the brushes very evenly, there is no ridges and paint is uniform and flawless all over. This technique is most suitable for damaged and rough textured surfaces like peeling paint. You can use any type of painting liquid with an airless gun. Airless sprayers are capable of applying an extra wet coat of paint and this helps the paint to adhere better to the surface and it’s long-lasting. Piston Pumps – This product uses modern piston pump rather than a traditional compressor or air turbine. The X5 piston pump is a lot powerful and allows faster painting. The pump is of stainless steel, thus it’s durable. Smaller size – This sprayer is smaller compared to others, it’s very compact, thus easy to handle and use. It easily fits in your trunk. Flexible suction tube – The X5 suction tube is pretty flexible and this sprayer does not depend on any internal of paint. Powerflush adapter – This feature allows super easy cleaning, you simply need to hook up your garden hose rather than connecting to a suction tube. Start the sprayer and water runs into it and it gets cleaned thoroughly. RAC IV Switch Tip – The Graco magnum airless paint sprayer uses RAC IV Switch Tip and one of the biggest advantage is a fine layer of coating. Now if were things of investing in an airless paint sprayer, go for Graco Magnum, its handly, function, superb and allows flawless painting. Once you invest in the model, regular maintenance and cleaning are important to prevent clogging. You also need to make sure there is no dried paint inside or else the unit would get damaged. Do not over spray as over-spraying means the droplets are being wasted in the air. If there is a situation of recoating, do it in fast and thin coats because thick and slow painting would lead to paint runs.